GiveIndia is a professionally governed and managed Indian nonprofit organisation dedicated to promote a "giving culture" in India. Our mission is to promote efficient and effective giving that provides opportunities for the underprivileged in India. How is GiveIndia different from other NGOs? Here are some of the things that make us unique: 1. We do not raise funds for ourselves, but offer you the chance to donate to any of a wide range of NGOs that have cleared specific norms of credibility and accountability. 2. We work hard to keep our cost of fundraising down to a single digit - 9.1% (6.5% for iGive donations). Most other funding intermediary organisations spend between 20-50% on fundraising. 3. We offer you a wide range of 'donation options' from NGOs working on a variety of causes. 4. GiveIndia provides you with in-depth details of NGOs listed with us. 5. GiveIndia sends you a feedback report on every donation** you make. This feedback contains details about the beneficiary and that lets you know how your money has made a difference. ** Except for the Marathon, during which we list NGOs chosen by runners, and hence do not provide feedbacks for donations to these NGOs and in the case of iGive projects that are not certified by us and are put up directly by the page owners. GiveIndia is owned and managed by GIVE Foundation, a nonprofit organisation dedicated to raising funds for good NGOs in India. GIVE Foundation was set up by Venkat Krishnan, an IIM-A graduate who previously worked with the Times Group and Sony TV. What do you mean by a GiveIndia listed NGO? A GiveIndia certified NGO has cleared stringent norms of credibility and accountability. We have a thorough, transparent and objective selection process for the NGOs profiled on our site. * Organisations must be registered nonprofits that implement social development projects in India, with no political affiliations. * At least 50% of their beneficiaries must be economically underprivileged. * Organisations must be unbiased in their beneficiary selection i.e. non religious / non political. * The organisation must be willing to create donation options and provide prompt feedback for the donations. How much of my donation reaches the NGO I select? GiveIndia ensures that 90.9% of your contribution reaches the NGO you have chosen by keeping fundraising costs at 9.1%. In the Payroll Giving programme, the company makes a donation of 9.1% of total contributions, so 100% of the employee's donation is passed through. The 9.1% donation retention covers all our costs including the due diligence, sending the money to the NGO, sending you your feedback report, the credit card charges which are often as high as 4% of your donation size*, and providing ongoing donor support including provision of online accounts and facilities. **For U.S.-tax paying donors on GiveIndia.org, Paypal charges 2.2% plus 30c per donation. For U.K.-tax paying donors on GiveIndia.org, Stripe charges 2.95% plus 0.25 Euros per donation as a fee for their services. Why does GiveIndia say it is 9.1% when it actually comes to 10% of what I donate? When you donate Rs.100 to an NGO and Rs.10 to GiveIndia, you donate a total of Rs.110. Of this, GiveIndia retains Rs.10 and passes on Rs.100 to the NGO. Thus, what GiveIndia retains as a part of your TOTAL contribution is Rs.10/110, i.e., 9.1%. Most intermediaries like UNICEF, Oxfam, CRY etc. would report fundraising costs as a percentage of TOTAL contribution (i.e., what percentage of the TOTAL they have retained). In order to keep our percentages comparable to theirs, we compute it in the same way, and hence use 9.1% as the figure we report to you. Please tell me more about the 9.1% that GiveIndia retains. GiveIndia retains a maximum of 9.1% in order to provide you with the high quality support you have come to expect when transacting through us. By taking this donation, we are reducing our dependence on grants and increasing the chances that we will be around for a lot longer to serve donors, NGOs and beneficiaries. Payroll Giving: Since the inception of the Payroll Giving programme in 2003, more participating companies have made this donation of 9.1% to GiveIndia. This has led to the companies taking greater ownership of the programme and to employees feeling that their company is a good corporate citizen. It also allows 100% of the employees money to go to cause of their choice. Regular online donations: Ever since GiveIndia started in 2000, there has been a cost to online donations. Till June 1, 2008 we subsidised these costs with a grant from ICICI Bank. However with our plans to scale up the volumes of online donations in the coming years, we are forced to retain a small part of the donation from our customers. So as of June 1, 2008, we began retaining 9.1% of what online donors contribute. Effective October 1, 2011, this was reduced to 6.5% for iGive donations only. GiveIndia believes that you, the donor, would be much more concerned about our cost of fundraising than a grantmaking organisation, and this concern will force us to be efficient. Consider 2 examples, Intermediary 1 that spends 10% on fundraising and deducts this from the donation, and Intermediary 2 that spends 25% on fundraising, but deducts only 5% from the donation, getting the balance 20% from some grantmaking agency. While Intermediary 1 is actually the more efficient organisation, donors may tend to support Intermediary 2 because less of their money is spent on fundraising. Grantmaking agencies are typically far less demanding than individual donors and there will be no pressure to reduce fundraising costs much below the 20-25% level. In the non-profit sector, what do other NGOs charge for similar services? Every non-profit organisation has costs and unfortunately for donors, these costs aren't usually stated in a way that make it easy to compare which ones are the most efficient. Other intermediaries do not disclose their costs clearly, often masking them as "advocacy expenses". The cost of advocacy and fundraising for most intermediaries is typically in the 20%-40% range. With the possible exception of religious and spiritual institutions, GiveIndia has one of the lowest fundraising costs. Tell me more about the feedback report I will receive for my donation. Typically feedback reports** are emailed to donors within 4-6 months after receipt of the donation. In the details for each donation option on GiveIndia.org, we provide information on what feedback will be provided for that donation option. **The only exceptions are the marathon, during which we list NGOs chosen by runners, and hence do not provide feedbacks for donations to these NGOs; and in the case of iGive projects that are not certified by us and are put up directly by the page owners. What tax benefits will I get for my donations through GiveIndia? u/s 80G of the IT Act up to 50% of your donation is deductible. u/s 35AC of the IT Act up to 100% of your donation is deductible. u/s 501(c)(3) only if you register as a U.S. Tax Payer on our site before you donate. Please note that donations made with your tax paying status set to any other type are not eligible for 501(c) (3) benefits, even if you subsequently change your profile on our site. If you are a U.K. taxpayer, for every pound that you have donated, GIVE UK can reclaim 28 pence from the IRS helping your donation go further. To qualify for Gift Aid, the income tax or capital gains tax you pay must at least equal the amount we will claim in the tax year. To Gift Aid donations, please register as a U.K. tax payer or modify your profile accordingly. When you make a donation, you will be asked if you would like to Gift Aid your donation. Please click on the "Yes, I would like to Gift Aid" button and we will reclaim GiftAid for your donation. Will my company accept my 80G/35AC receipts and provide me tax benefits? The Government of India does not allow companies to provide tax relief in salary against donation receipts. The same can be claimed (or adjusted against other income) while filing your income tax returns. As per Circular No. 1/2010 [F. No. 275/192/2009 IT(B)], dated 11-1-2010, section 5.4, Sub Section G - No deduction should be allowed from the salary income in respect of any donations made for charitable purposes. The tax relief on such donations as admissible under section 80G of the Act, will have to be claimed by the taxpayer in the return of income. Is PAN a mandatory requirement to avail tax benefits for my donation? PAN is a mandatory requirement only if you wish to donate to a 35AC donation. It is not required to make an 80G donation. If you select a 35AC donation, you will be asked to update your profile with your PAN, if not already filled in. Why should I donate through GiveIndia? 1. GiveIndia gives you complete flexibility on choosing not just the NGO or the cause you wish to contribute to, but also the impact you would like to create. 2. GiveIndia coordinates with its partners to give you detailed feedback on how your money is used ensuring complete transparency. 3. To ensure that your money reaches the right people and is utilised appropriately, GiveIndia requires certified NGOs to meet the Credibility Alliance Norms. Every listed organisation is scrutinised for accountability and transparency before being taken on board. 4. Your contributions to GiveIndia will receive tax deductions u/s 80G of the Indian Income Tax Act. 5. GiveIndia is run by professionals from the corporate sector who have chosen to help the less fortunate. How does GiveIndia support itself? In order to make GiveIndia sustainable in the long run, we retain 9.1% of donations made through us. This helps us recover a reasonable portion of our operating costs, but not fully. GiveIndia has received a grant from ICICI Bank to cover its annual deficit. We try and keep our costs low, by obtaining free or subsidised services wherever possible. ICICI Bank provides free internet banking and a very low cost payment gateway. Several ad agencies and others provide pro bono services to help us, and we have an army of volunteers that drive several aspects of our operations, thus helping keep costs even lower. This is what helps us keep our total costs to under 10% of all donations raised, against an industry benchmark of 30-50%. How does GiveIndia manage to keep their costs so low? * Our highly committed employees have chosen to work with us and by doing so, they earn less than what they would in the corporate sector.. I like what GiveIndia is doing. Can I donate money to you? GiveIndia does not accept donations for its work - we are treating the initial corporate grant we got as "seed money" till we reach self-sustenance. The best way to support us is to donate more through us, demand a good service and pay us a fair charge for the same. Are GiveIndia employees paid for their work? Our team consists of around 50 full-time and part-time employees and several volunteers. Our employees are often professionals from the corporate sector who have chosen to help the less fortunate over a mainstream career. Although they receive regular salaries, these are way below corporate standards. Our volunteers work with us for free. Yes, GiveIndia publishes an Annual Report every year, which summarises our activities as well as contains our Financial Statements. here to view/download a PDF version of the Annual Report. Why do I need to register with GiveIndia before making a donation? 1. We need to capture your contact information to send you donation receipts and feedback reports. 2.The Government of India regulations stipulate that every NGO that seeks funding from any person who is not an Indian national must possess an FCRA certificate. That's why we ask you to select your tax receipt type, and in some cases nationality too, before presenting you with donation options. 3. The Government of India requires us to keep track of the full address of each donor. Please be assured that GiveIndia will not use your personal details for any other purpose. Please be sure to use an email ID you use often. This will ensure that you do not miss out on any communication from us, regarding your donations. What is my user ID? Can I change it? If you have received any mail from info@giveindia.org in your email, that particular email ID of yours is your user ID on GiveIndia.org. Please use an email ID that you use often when you register at GiveIndia.org as all communication will be sent to this ID. You can change your user ID on GiveIndia by updating your profile. Simply log into the GiveIndia site, go to 'My Profile' and update the e-mail ID field. Why am I asked for my passport number when I try to register as an NRI? The Ministry of Home Affairs, Government of India, requires us to store passport numbers of NRIs who donate online. Since the source of funds is outside India and the donation is exempt under the Foreign Contribution Regulation Act, they require us to capture this information. If you register as a citizen of another country, you will be able to donate without providing your passport number. However you will be able to choose only those NGOs on our site that are allowed to receive funding from foreign citizens. Lost my password. What do I do now? Click on the 'Forgot Your Password?' link provided at the top right hand corner of the site; or Click here. A new password will be sent to your email ID. When you log in with your new password, please take a minute and change it to one that you can easily remember. You can now also log in to your GiveIndia account using Facebook! If your GiveIndia email ID matches with your Facebook email ID, you can simply log in to GiveIndia using your Facebook ID. Else, log in to your GiveIndia account and then connect with Facebook using the "Facebook Connect" button at the top right-hand corner. GiveIndia sent me a password. Can I change it? Yes! Please do change it to something you can remember and be doubly sure by storing your new password in a secure location. To change it, you need to first log in and then click on 'Change password'. Remember that your password is case sensitive. Tried to log in but got a message saying my account is locked. What do I do now? Your account has been locked for security reasons because the wrong password was entered three times while attempting to log in. Please check your mailbox for an automatically generated message from GiveIndia that provides detailed instructions on how you can unlock your account. If you can't find the email, please first check your spam folders, then write to info@giveindia.org for more help. I don't seem to be getting messages from GiveIndia. What could the problem be? Several mail services like Yahoo, Hotmail and Gmail have spam filters in place. Be sure to add the ID info@giveindia.org to your address book so you keep receiving important mails about your account. What is My Account? How do I access My Account?. Log into GiveIndia.org with your username and password and click on 'My Donation History' in the left menu. This is where you can see details of all the donations you have made. Step 1: find a donation option that you would like to support. Then, click on the 'Donate' button. Step 2: If you are already registered on GiveIndia, log into the site with your email ID and password. (click on 'Forgot Your Password?' incase you do not remember your password, and a new one will be emailed to you, which you can use to log into the site). If you are new to GiveIndia, fill up the details under the 'New to GiveIndia?' part of the page. Step 3: You will be taken to your Donation Cart page. Select your mode of payment and click 'Pay Now' to complete payment for your donation. - To make a credit card/net banking donation. I want more information about the NGOs. Where do I find this? I've heard of Gift a Donation. How does it work? You can gift a donation to a dear friend or relative on special occasions, instead of giving them flowers or other gifts. When you 'gift a donation' to a friend/ relative, you continue to get the receipt and tax deduction, but a message is sent to your friend/ relative, indicating that you have gifted a donation on his/her behalf. Both you and your friend are sent the feedback report on how the donation made a difference. Step 1: If you are already registered on GiveIndia, log into the site with your email ID and password. (click on 'Forgot Your Password?' incase you do not remember your password, and a new one will be emailed to you, which you can use to log into the site). If you are new to GiveIndia, register with us. Step 2: Select a donation option that you would like to support. Tick the 'Gift this Donation' box, then click on 'Donate'. Step 3: You will be asked to fill in the recipient of the gift's name and email ID (If you would like to send it to multiple Email IDs, then enter all Email IDs separated by commas); along with a message that you would like to send him/her. Step 4: Once done, you will be taken to your Donation Cart page, where you can pay for your gift. Please click here to learn more about standing instructions. What is a Corpus Fund/General Fund donation? To be sustainable, NGOs need to build up a strong organisation. Given the erratic nature of funding, developing a corpus/general fund is one way that NGOs can do this. When you donate to the corpus/general fund, this helps NGOs to design long-term programmes without worrying about programme support from aid agencies, and to meet some organisational costs that no one else is willing to bear. Funds in the general fund can be used at any time, whereas money in a corpus can normally not be touched - the organisation is supposed to use only the interest that accrues from investments made out of corpus donations, without touching the principal itself. Why doesn't every NGO have a corpus or general fund? Some NGOs choose not to have a corpus fund. Almost all NGOs do have a general fund that they accept money into. Some NGOs do not have GF because they choose not to create one on our platform. There could be two possible reasons (a) NGO wants to use GiveIndia only for specific projects and hence does not want to create GF (b) all other expenses of the organisation are met by different donors and hence no requirement for GF. My preferred donation option is no longer listed on your website. Why? NGOs have predefined requirements for each donation option based on their current operating capacity and need for funds. Once the need has been fully met, the donation option is automatically removed from our website for the rest of the period. We also delist donation options where the NGO is unable to provide feedback reports to donors despite repeated reminders and follow-ups from our side. Do you have a setup to accept money in the US, which has tax exempt status? Yes, we have a partner, GIVE Foundation, Inc., a 501(c)(3) registered nonprofit organisation that accepts money in the U.S. Simply register as a U.S. taxpayer on our website and donate to send money via GIVE Foundation Inc.
All donations through this route are tax-exempt in the U.S.
Why donate through GiveIndia rather than directly through the NGO's website? * GiveIndia assures you that your money reaches the cause that it was donated for and provides a feedback report on the utilisation of your money. * You can donate through a range of payment options - online banking, credit card, cheque/demand draft, and cash-on-delivery (for Indian taxpayers donating between Rs. 3,000-9,000 only). How long does it take for my donation to reach the NGO? After you donate online, it may take around 24-72 hours for your payment to be approved. GiveIndia disburses donations of a particular month on the 10th of the following month. This is applicable for donations made in India. For those in the US/UK, donations made by the 15th of the month are disbursed to the NGO on the 10th of the following month. The extra time required is due to high lead time in bank transfers and remittance procedures from US/UK to India. Please visit the iGive Help Centre to learn about the disbursal of funds for iGive pages. How is the exchange rate on your site determined? GiveIndia follows a reliable refund policy to let our donors feel privileged about their association with us. We take utmost care about processing donations as per the mandates signed by our donors in the donor forms, both offline and online. But in case of an unlikely event of an erroneous deduction or If the Donor wants to cancel/deduct the donation, GiveIndia will respond within 7 working days from the date of receiving the complaint from donor. The timely refund of the wrongly deduced amount will depend on type of card used during transaction. We would require a proof of deduction of the donation amount and a written communication for refund from the donor within two days after donation. • In such cases if the receipt already has been issued, then the Donor need to return the original receipt at our official address. • In the case of tax exemption certificate already issued, refund will not be possible. I want to know the different ways that I can pay for my donation? You can use your credit card on our site. Indian donors may use debit cards too. You can also donate by cheque if you do not prefer giving details on the internet. I want to make an online credit card/ debit card donation. Is your site secure? - For user registration or login, we provide you the option of Thawte SSL (Secure Sockets Layer) with 128 bit encryption for highest security. - In order to preserve user's confidentiality, the login passwords are encrypted before being stored. - The information that we capture is minimal - only the basic data that law requires us to obtain. - GiveIndia does not capture or store your credit card or banking information. You enter this information directly on the Bank's website while making a donation. VBV protects your existing Visa card with a password that’s been created by you and provides the added assurance that only you can use your Visa card online. For more details on VBV, please click here..
MasterCard Secure Code is a service that uses a private code to help protect your card against unauthorized use (when you shop at participating online merchants). MasterCardSecure Code (The MasterCard Secure Code Program) is a comparable security facility to VBV. For more details click here..
Error while donating through credit card/netbanking. Was my donation successful? To check status of your payment, please click on My Donation History on the left panel after you log in. Your payment has been received if your status shows Verified, Credited, or Disbursed, and has not been received if it shows Cancelled. If it shows as Pending, please wait till the status is updated. Note that the verification of payment in such cases is a manual process. Hence, please allow 2 working days before you check with us for an update on your payment status. Why does a debited net banking/credit/debit card donation still show as 'Pending'? Sometimes, when making net banking/credit card/debit card donations, the money reaches the payment gateway provider but does not reach GiveIndia's accounts. In such cases, the transaction goes into 'pending' mode. As we receive the money from the gateway, we manually confirm receipt of the same and update the status of the donation from 'pending' to 'verified'. This may take upto 72 hours. I want to make a payment by cheque. How does that work? You will receive a confirmation mail from GiveIndia after your cheque is credited. Why is there a delay in crediting my cheque? There may be at times delay in crediting NRO/NRE cheques. Due to strict regulations on accepting donations from NRO/NRE accounts, banks are reluctant to credit the amount without sufficient proof on the nature of these funds. As a part of this process banks conduct a series of checks to ensure that all statutory requirements are met and could insist on nationality proof of the donor causing further delays. This typically takes 4-6 weeks. Hence if possible we urge you to use other forms of payment (Credit Card, Paypal etc.) to ensure that your donation reaches the needy faster. Do you have a tie-up with any banks? Yes, we do so. You can use the Net Banking service of the following banks to make a donation. Why do I see a payment to IndiaIdeas.com Ltd. when I pay by Netbanking? Don't panic – that's us. IndiaIdeas.com Ltd. is a company which provides various payment services to other companies. We've partnered with them to enable a host of Netbanking payment options for our customers. Your session expired due to security reasons. This happens, simply, when you take too long to make the direct debit payment and don't manage it in the specified amount of time. Go back to the GiveIndia home page and start over. We know it's annoying, but it's all for security. I am located in Europe/USA. A Visa/Mastercard donation is just not going through. Many of our donors in Europe/America have written in to us with this complain. On investigation, it was revealed that many banks in Europe/America have intentionally blocked transactions to many countries - one of them being India. This has been done in the customers' best interests, to keep accounts safe from fraudsters. If you call your bank and confirm the genuinety of your transaction, the bank will allow your donation to go through. I am using an international credit card. The donation is just not going through. Beginning October 20th, 2011, we have implemented the Verfied by Visa (VBV) and MasterCard Secure Code on our site for transactions made by international credit cards too. This is an important security feature that we have introduced to reduce the risk of Internet fraud. In order to make a successful transaction on our site, you would need to have the same. Learn more about Verfied by Visa (VBV) and MasterCard Secure Code. When will I get a receipt for my online donation? If you made a donation that is eligible for tax benefit 80G via credit card/Internet banking or from your account, a receipt is immediately emailed to you. Please check your email once you complete making your donation. The receipt can also be accessed by logging into GiveIndia.org and clicking on 'My Donation History'. I have made a donation; so why haven't I received my receipt? » If you have made a cheque payment, the receipt is emailed to you after the cheque is credited. » If you have made a donation that is eligible for tax benefit 35AC, a receipt will be emailed to you. This procedure will take 45 days. » If you made an Account Deposit then no receipt will be issued. Receipts for these sums will be issued when you donate the money from your account balance. » If you made a donation that is eligible for tax benefit 80G via credit card/Internet banking or from your account, a receipt is immediately emailed to you. Please check your email once you complete making your donation. The receipt can also be accessed by logging onto GiveIndia.org and clicking on My Donation History. I've lost my receipt. What do I do now? In case you have misplaced your receipt, you may print out another one by logging into GiveIndia.org and clicking on My Donation History. Click on the receipt that you have lost and a PDF of the receipt will download onto your computer. Can GiveIndia send me a receipt by post or courier? We normally do not send certificates by post or courier, to keep our overheads low and to ensure that the maximum amount of money can reach the NGOs you are supporting. A printed copy of the PDF receipt is adequate for your tax returns and for claiming a deduction, since it carries the transaction details and our 80G registration number. I would like a copy of the Sec.80G certificate. Where can I find it? GiveIndia provides the 80G number on the receipt itself, in keeping with Income Tax Department rules. You do not need a copy of the 80G certificate to claim your deduction. However, for your own reassurance, you can download a copy of our 80G certificate. As per the Finance(No.2) Bill, 2009, all 80G certificates issued by the Commissioner of Income-tax expiring on or after 1st October, 2009 shall remain valid forever unless specifically withdrawn. Therefore, the 80G tax exemption certificate issued by GiveIndia to you will remain valid and can be used for tax exemption purpose. Why did I get a 35AC receipt from the NGO I donated to and not from GiveIndia? You got a receipt from the NGO you donated to only because that donation was eligible for tax benefit 35AC or 35(i)(ii). GiveIndia sends receipts for all donations that are subject to tax benefit 80G. Why does it take 4-6 months for my feedback? 1. The donation has to be utilised by the NGO for a beneficiary. NGOs may not have beneficiaries readily available at the time that they receive the donation. 2. Some donation options such as those relating to construction of wells, or planting for kitchen gardens require more time. The process that we follow is - once a donation has been disbursed, the NGO send us the feedback as per what was committed by them. These reports are further processed for accuracy, appropriateness , language and formatting. We are currently using Desi Crew for this part of the process. We receive the formatted reports and then they get sent off to the donor. We will continue to strive to reduce the time and have incorporated many systems and processes both at our end and the NGOs' that will make this more easily possible. Tell me more about the GiveIndia feedback report I will receive for my donation? Typically feedback reports** are emailed to donors within six months after receipt of the donation. In the details for each donation option on GiveIndia.org, we provide information on what feedback will be provided for that donation option. **The only exception is in the case of iGive projects, which are not certified by GiveIndia but put up directly by the page owners. Hence, GiveIndia does not provide feedbacks for donations through iGive pages. What type of feedback report do I get when I make a Corpus Fund donation? To be sustainable in the long run, all NGOs maintain a Corpus Fund. Usually the interest (that accrues on this amount) but sometimes the principal amount itself is used as and when the NGO deems necessary. Possible purposes of utilisation of this fund are decided at the beginning of every financial year as per the NGO's corpus fund policy. These include funding of projects, payment of staff salaries, contingencies etc. This information is submitted to us and is readily available to share with donors who contribute towards an NGO's corpus fund so that is why donors don't have to wait for a Corpus Fund feedback and receive it immediately. Every individual donation made towards an NGO's corpus fund collects in this account and the accumulated amount is eventually utilised for a specific purpose. That's why every donation made towards an NGO's corpus fund receives the same feedback. What type of feedback report do I get when I make a General Fund donation? All NGOs maintain General Funds. General Funds are used to support both the programme activities of the organisation as well as associated administrative costs. NGOs send us a list of their activities/programmes along with other details, such as their total annual budget and the approximate number of beneficiaries they reach out to. This information is readily available to share with donors who contribute towards an NGO's general fund; so that is why donors don't have to wait for a General Fund feedback and receive it immediately. Can I write to or visit the beneficiary in my feedback report? NGOs typically do welcome visitors, though they may have preferred timings so that they can facilitate visits. GiveIndia encourages donors to contact the NGOs directly and set up meetings at their convenience. Most NGOs do not allow donors to visit the specific beneficiaries that they have supported or sponsored, as it can often give rise to awkward situations for the beneficiary. However, they would typically allow donors and visitors to meet with and talk to their beneficiary communities in general. GiveIndia itself conducts random verification visits to ensure that beneficiaries do exist. If there is a group of donors (at least five) from a specific company or group that would like to visit an NGO, GiveIndia would be happy to talk to the NGO, connect a representative from the group with the NGO representative and facilitate a visit. The donors will need to make their own travel and other arrangements. Please ensure that the visit guidelines and timings of the NGO are adhered to in such cases. What does a feedback report contain? 2) Name of supported beneficiary. I see donation options in my Feedback report mail. How are these options chosen? Based on your previous donation and it's amount we choose three donation options you may like to support. What are feedback verification visit reports? Feedback verification reports are reports filled out by volunteers/staff after a verification visit to an NGO is done.These reports are an additional way through which GiveIndia checks the credibility of its NGOs. Visits are conducted periodically by volunteers through a set process. A random feedback report is selected and a volunteer visits the NGO to verify the authenticity of the beneficiary details provided in the feedback report. How are verification visits conducted? Can I help with a verification visit? GiveIndia needs volunteers to perform verification visits. If you would like to volunteer for the same, please contact us at info@giveindia.org. How genuine are verification visits? The visits are surprise visits and hence the beneficiary / NGO are not aware of the exact time of the visit. Also, the volunteers are asked to provide us a report in a prescribed format mentioning all the details observed; which ensures that the visits are genuine. What steps will GiveIndia take in case of failed verification? When a verification fails, it is either because the beneficiary does not exist or the benefits given to him as described in the feedback report are found to be false. We seek clarification from the NGO and also schedule a follow-up verification visit for another beneficiary of the same NGO. If even after the revisit, the NGO fails to correct its process & procedures, then the NGO will be delisted from our portal. How can we be sure that the NGO did not know about the verification visit? NGOs are not aware that verification will be done. We do not verify the NGO per se but a beneficiary that is supported by the NGO. The details of this beneficiary and the benefit(s) received are already with us through the feedback report that the NGO has sent and we usually meet the beneficiary directly. Has the donation made by me been verified? While it is difficult to verify every donation made through us, we try to randomly verify donations made for every NGO on our portal. Can I volunteer to verify the donation option that I donated to? Generally, our feedback team picks up the donation option for verification visits. However, if you would like to verify the donation option that you donated to, you can contact us at info@giveindia.org. What are feedback efficiency ratings? These ratings reflect the feedback sending efficiency of GiveIndia-listed NGOs. It compares how good an NGO is at sending these feedback reports for the donors. Why are we rating NGOs for their efficiency in sending us feedback reports? » GiveIndia's commitment to the donor is that every donor will receive a customised feedback report on how the donation was utilized. » We aim to send this report to you within 3-5 months of the donation. » NGOs send in the reports for the donations received by them every month, which is further, processed by GiveIndia and then sent on to you. » We believe that the sooner you receive a feedback, the more likely it is that you will engage with the cause/NGO that you have supported. We have instituted many systems and processes to make it simpler than before for NGOs to send us these feedbacks. » Many of our NGOs have also created mechanisms at their end to quicken the pace at which these feedbacks get sent to us. *Outstanding feedbacks reports are all transactions which have been disbursed to the NGO but feedback has not been received. How do I start Standing Instructions from my ICICI/HDFC Bank account? You can start Standing Instructions from your ICICI/HDFC Bank account by following these steps. My bank has all my personal details. Why am I being asked to fill these in again? KYC (Know Your Customer) norms prevent a bank from sharing your personal information with third parties. Therefore you need to fill these details in again. - Balance as on (date) in INR. Remember, you need as little as Rs. 250 in your account to make a donation. I have accumulated a good sum now and wish do donate it. How do I do so? Step 1: Select a donation option that you would like to support. Then, click on the 'Donate' button. Step 2: Log into the site with your email ID and password. (click on 'Forgot Your Password?' incase you do not remember your password, and a new one will be emailed to you, which you can use to log into the site). Step3: You will be taken to your Donation Cart page. Click on the 'My Account' button to proceed to pay for your donation. Step 4: Complete your donation by clicking on 'Pay now'. What is the minimum amount to enroll in the Standing Instructions programme? You can participate in the Standing Instructions programme for as little as Rs. 100 per month. However, the minimum accumulated amount needed for a donation is Rs. 250. A larger deduction will help money accumulate faster and also give you a wider variety of donation options to choose from. My Standing Instructions deduction has been made but I don't see it in my account. It takes about a month for your first deduction to reflect in your GiveIndia account because that's how long it takes your bank to pass on the details to us. Subsequently, your deductions will reflect in your GiveIndia account in a week; as it takes us a week to get these details from your bank and upload the same. Do my monthly bank account debits get donated to an NGO? No, the amount that gets debited from your bank account every month accumulates in your online GiveIndia account. The login details and password are mailed to you. You can then log into this account and donate to an NGO/cause of your choice. Mismatch between amount deducted by my bank and the amount on the receipt. We retain 9.1%* of all donations made through us. When transferring your monthly deductions from your bank account to your GiveIndia account, this 9.1% is deducted. That's why the money in your GiveIndia account is less than what has been deducted from your bank account. You will get a receipt for your entire deduction. Receipt for the 9.1% will be mailed to you as soon as the balance reflects in your account. You will receive a receipt for the remaining amount when you make a donation. *The 9.1% donation retention covers all our costs including the due diligence, sending the money to the NGO, sending you your feedback report, the credit card charges which are often as high as 4% of your donation size*, and providing ongoing donor support including provision of online accounts and facilities. Rs. zero transaction with a non-zero GiveIndia donation amount in my History. You will see such a transaction only if you were part of ICICI Bank's Standing Instructions programme prior to July 2009 i.e. when the programme was operated offline. In July 2009, we took the programme online. All online donations made on GiveIndia entail a 9.1%* retention. When transferring your balance amount online, we deducted this 9.1% donation. Which is why you see a transaction for Rs.0 with a GiveIndia donation amount which entitles you to a receipt of this 9.1%. How will I receive a receipt for my donation? As soon as you complete your donation on the GiveIndia site, you will be emailed a tax receipt. In case you have misplaced an old receipt, you may print out another one by logging into GiveIndia.org and clicking on My Donation History. Click on the receipt that you have lost and a PDF of the receipt will download onto your computer. How do I stop Standing Instructions from my ICICI / HDFC Bank account? To discontinue contribution you need to send (by post or courier) us the request letter which we will send to bank. Please find attached request letter Here. The change will be implemented from subsequent month. You need to send this at the address mentioned below. What do the ratings/comments found on certain pages of the site mean? GiveIndia's new ratings and comments feature lets visitors leave a rating or comment on any of the following pages of the site - all GiveIndia tier I listed NGO's information pages, all GiveIndia tier 1 listed donation option pages and all iGive pages created on the site. This feature has been introduced to promote a healthy discussion between all stakeholders on information found on the GiveIndia site as well as giving in general. These are independent views of visitors to the GiveIndia site and in no way do they affect an NGO's listing status on GiveIndia. They are not the views expressed by GiveIndia or any of the organisation's employees. Individuals as well as NGOs are free to repond to any of the ratings/comments posted through the site - revealing their profiles or as guests. You can subscribe to the GiveIndia.org newsletter by sending a blank email from the email ID you wish to receive the newsletter in, to info@giveindia.org with 'Subscribe' as the subject. To unsubscribe from our mailing list, please send a blank email from the email ID you wish to remove from our mailing list to info@giveindia.org with 'Unsubscribe' in the subject. Can I volunteer at GiveIndia? Yes, but please keep in mind that GiveIndia does not work directly for the poor, the disabled, the aged etc. If you want to work with underprivileged people we recommend you contact one of the NGOs listed on our website or try http://www.ivolunteer.in. If you are interested in helping us through your professional skills, then please sign up to volunteer with us. We are always looking for volunteers with expertise in the following areas: Feedback Processing and Creative Design (Marketing materials). If you have a different professional skill set, then still please do write to us; there are many other areas in which GiveIndia needs support. Please click here to learn more. What are some of the ways I can support the work GiveIndia does? There are many ways you can help us: 1. Do you have a website of your own? Yes,then put up GiveIndia banners on your site so that your site users can find us. 2. Add a GiveIndia message (GiveIndia - the power to change lives) to your email signature line and spread the word among your friends, family and colleagues. Your personalised signature line can be a very powerful tool. For more sample messages, please click here. Winners will be computed and announced every month (on a YTD basis). Why has GiveIndia introduced a Hall of Fame? The Hall of Fame is our way of appreciating the individuals and companies who work with us to make a difference. While the people who do the actual grassroot level NGO work are heroes, so are the donors who make their work possible through their generousity. How can I be eligible for the Hall of Fame? Every month, the results for the four different Hall of Fame categories will be computed and announced. As long as you have given consent to be part of the Hall of Fame , you will be eligible. To give your consent as a donor, please update your profile by selecting 'yes' in the field 'Donor Hall of Fame'. What is the scoring mechanism for the Halls of Fame? * Points are only awarded for online donations towards donation options or iGive. Offline donations will not carry any points. How do I activate 'Credit Card-Standing Instructions programme'? You can start your credit card standing instructions programme by simply filling in the form available here. I am providing my Credit Card details, how safe is it? - As we are not capturing your CVV number, the card details cannot be used for any online transaction. Also to use a credit card online, RBI guidelines require a password. So, giving us your card details no longer means that your card can be misused. How many days will it take for the programme to get activated? As soon as you register, you'll receive an acknowledgement mail from GiveIndia. A GiveIndia online donation account will be created for you. The details for the same will be communicated after your first debit has happened. Which date is my credit card debited? Your credit card would be debited on the first working day of every month. The first debit happens in the next month after you join the programme and subsequently on the first working day of every month. Is the money that gets debited to my credit card every month donated to a NGO? No, the amount that gets debited to your credit card every month accumulates in your online GiveIndia account. The log-in details and password are mailed to you. You can then log-into this account and donate to an NGO/cause of your choice. What is the minimum amount to enrol in Standing Instructions programme? You can participate in the programme for as little as Rs. 110. - Balance as on (date) is INR (amount). - Remember, you need as little as Rs250 in your account to make a donation. I have accumulated a good sum now and wish to donate it. How can I do so? Step 1: Visit GiveIndia.org and enter your User ID and password. Step 2: Begin browsing the causes listed on the left of your screen. Select your favourite cause/NGO and find a donation option that you like. Step3: Finalise your donation option by clicking on it and entering the desired quantity; then click on 'Proceed to Donate'. Step 4: Select 'My Account' as the payment option on 'Your Donation Cart' page and then click on 'Check Out' to complete the donation. Mismatch between the debit on my credit card and the amount on the receipt? We retain 9.1%* of all donations made through us. 9.1% is deducted when debiting your credit card and transferring to GiveIndia account. That's why the money in your GiveIndia account is less than what has been debited to your credit card. You will however get a receipt for the entire amount that has been debited. Receipt for the 9.1% will be mailed to you as soon as the balance reflects in your GiveIndia account. You will receive a receipt for the remaining amount when you make a donation. •*9.1% is retained by GiveIndia to cover its charges for processing of your donation, providing a tax receipt and a feedback report, a technical platform to track your donations, due diligence and other administrative costs. How do I stop my Credit Card Standing Instructions programme? If you wish to discontinue the contribution anytime, please write to info@giveindia.org requesting the same. The change will be effected from the subsequent month. How do I donate clothes/old toys and books/vessels, etc? Can you help me adopt a child? GiveIndia works as a trusted gateway that connects people with causes they wish to donate to. We are not an adoption agency and can provide no help to people wishing to adopt. Can GiveIndia provide financial help to individuals in need of support? GiveIndia only helps raise funds for good NGOs that have cleared specific norms of credibility and accountability. We do not facilitate raising funds for individuals, or other institutions. You may contact these organisations for help. Please note that these organisations are in no way connected to GiveIndia. We have done no background check on the same either. Why isn't animal welfare listed among your causes? GiveIndia has chosen to focus our energies on providing opportunities for the poor in India. This does not mean that we think animal welfare is an unimportant cause; it simply does not fit our mission. A relative of mine is suffering from a disease. Can GiveIndia support him/her? As of now we raise funds only for NGOs listed with us. We do not provide financial assistance to individuals. Instead you could visit the Sir Ratan Tata Trust website - http://www.srtt.org/ - as they provide individual grants for medical as well as educational purposes. Who can donate through the Monthly Giving for US/UK program? This programme is designed for US/UK taxpayers but anyone with a credit card can join. However, the tax benefits will not be of any value to you ( i.e. if you are not a US/UK taxpayer). I am an US/UK tax payer. How do I activate Monthly Giving? Follow these steps to activate monthly donations to an NGO of your choice. Do I need to visit the website every month or just once to activate the programme? You need to activate the programme just once in order to start giving every month. Your monthly donations would then happen automatically. Every month, your card will get debited for USD 11/GBP 11 and you will receive a tax e-receipt for the same from GiveIndia. How much will get debited from my credit card every month? The sign-up amount to donate every month is USD 11 (for US donors) and GBP 11(for UK donors). The same would get debited from your card every month and sent to your chosen NGO. Mismatch between Corpus/General fund donation price & debits on my card. The price of a Corpus/General Fund is around USD 5/GBP 4. However, this is for a one-time donation. For the monthly giving programme, the donation has been set to GBP 11/USD 11. Your card will get debited for GBP 11/USD 11 and every month and sent to your chosen NGO. How much of my contribution goes to my chosen NGO? GiveIndia retains 9.1% of all donations. So USD 10/ GBP 10 will goes to your chosen NGO. USD 1/GBP 1 will be retained by GiveIndia to meet our costs. Can I sign up to donate more/less than $11/11 GBP? No. You may activate the programme for the fixed amount of USD 11/ GBP 11 only. Can I change the amount that gets debited from my card every month? No, you cannot change the amount you candonate every month. I don't see the 'Donate Monthly' button against the NGO I wish to support. All NGOs are not part of the ‘Monthly Giving’ programme. Only organisations with an FCRA (certificate that allows them to receive foreign donations) and a Corpus/General Fund on GiveIndia are part of the programme. Also, note that the program is available only to US/UK taxpayers. 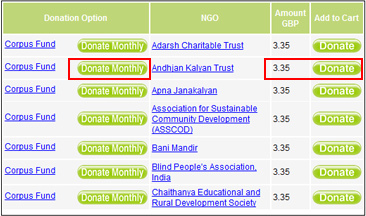 Hence, if you are an Indian donor or are on GiveIndia’s Indian pages, you will not be able to see the ‘Donate Monthly’ buttons. Please follow these steps to sign up for the programme. How do I stop my participation in the Monthly Giving program for US/UK taxpayers? When activating Monthly Giving, you would need to create a PayPal(US donors) or Google Checkout (UK donors) account, if you do not already have one. To deactivate, you will need to log into this account and cancel your monthly donation. Alternatively, you can write to info@giveindia.org requesting us to cancel the same. Please mention the email used to sign up for the programme along with the NGO you support, when you do so.